August 6, 1945 - 8:15 a.m. Peace and war from the beginning of time changed. 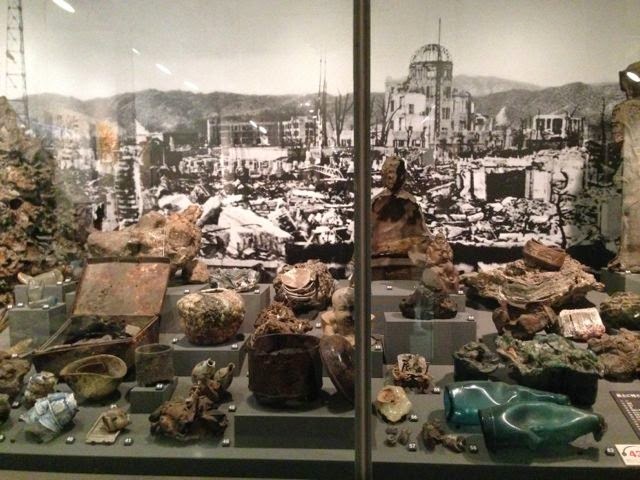 The first atom bomb was dropped by American planes on the selected community of Hiroshima, Japan. There was little strategic about this town on the delta by the Ota River flowing out to the Seto Inland Sea. 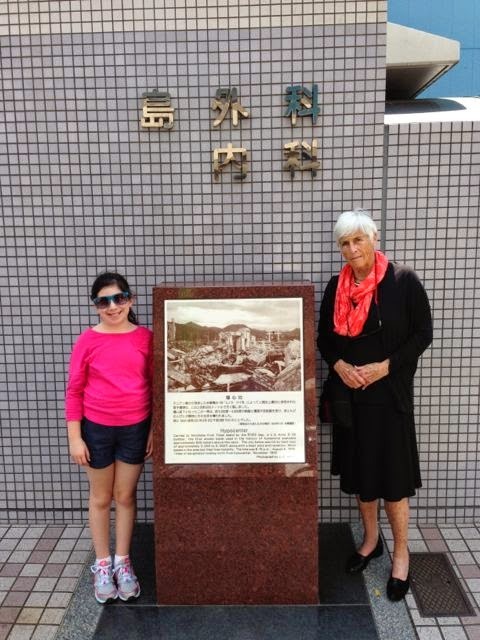 In this time, forced labor from Korea and China and children working in ammunition factories had contributed to making it one of the larger cities in Japan, then enemy of the United States. Hiroshima had been spared American earlyt bombing campaigns. But it was being considered a candidate for the first experiment with this a-bomb whose power no one could even calculate or suspect. Leaders in Washington had pinpointed Kokura, Kyoto, Nagasaki and Niigata along with Hiroshima as targets to see what the bomb could do. 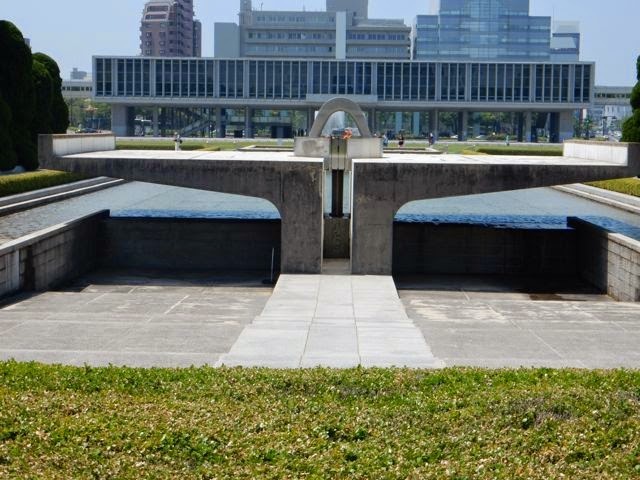 Hiroshima is surrounded on three sides by mountains and this was wrongly thought would contain the residue of the bomb. Nothing could or would. On this day the B-29 bomber Enola Gay flew low over the city and unleashed a horror way beyond anyone’s imagination in Washington or anywhere else in the world. President Truman hoped this would end the war and save the spending of million in defense money and thousands of lives. Well, it did. But the world, since the creation, would never be the same. Immediately 70,000 human beings were slaughtered, (animals and plants became ashes but are never counted) and a thriving city was reduced to such rubble no one had ever seen, worse than a thousand tornados, a dozen tsunamis. Worst than the end of the world might resemble to most. Think of the entire Shelby County area wiped out. All Americans should visit this place of memory and restoration. We need to know that we have escaped so much on our continent, and what we did to an island nation of people, from peasants to royalty, who at that moment in time, were our enemy because they had attacked our ships in a world war in Pearl Harbor (Hawaii) can not happen again. On this day in history, mankind awoke (if at all) to realize there was something more powerful than mankind - and it was not just God. And God allowed this devastation for a reason, we trust. Did we learn that we are fragile and wars are evil, greedy and no good? No. Did we imagine that a bomb the size of a buoy dropped on a bustling city could eliminate life for 140,000 in a second ,including those who died in the days following, the unborn fetuses distorted for whatever life they might have, those burned to scraps of humanity, those who were lucky not to have to live in the new society? Are we so insistent that we are right and everyone else wrong so that what we do and have done to others in war is arguable, even excusable, but when someone treads on our soil, i.e. 9/11, it is unconscionable no matter what the reasons? If what we did had good intention, it didn’t come out that way. The decision makers forgot that people count. That all people don’t mean or want to be a part of war. That the masses - every child and grandparent, every soldier and golfer, ever artist and teacher, whether agreeing with our way or not, have a right to live their way and not fear unknown terrorists are going to destroy the innocent of us, and the young men and women who sign up to protect us? I weep for our heroes in this modern world where war is only limited by the destructive power of the weapons in storage. The person in power has too much power and someone is always going to suffer, to hurt, to lose, if we don’t put peace in the forefront. Peace is living without fear. Peace is trusting someone is taking care of us while considering others’ lives as well. Peace is discussing the issue and trying not to be God. Sadly, even seventy years after that crucial event, peace does not reign. 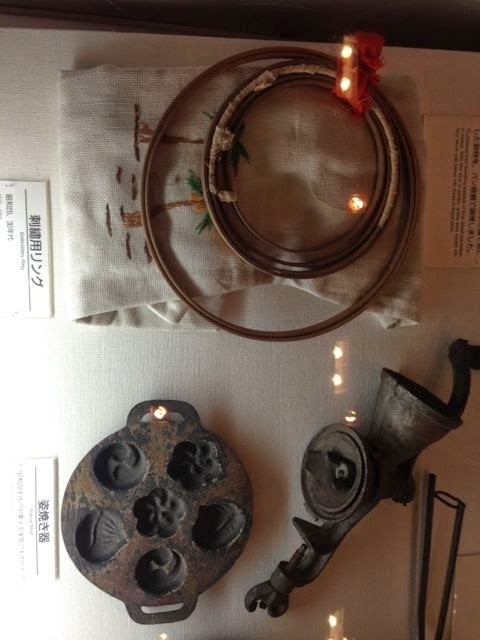 The hibakusha or survivors became the builders, the restorers, the hope for Japan, but they also suffered terrible discrimination by other Japanese, probably more out of fear of health issues, but important is that these survivors and their heirs are now the leaders in eliminating nuclear weapons from all nations and bringing peace to the whole world. 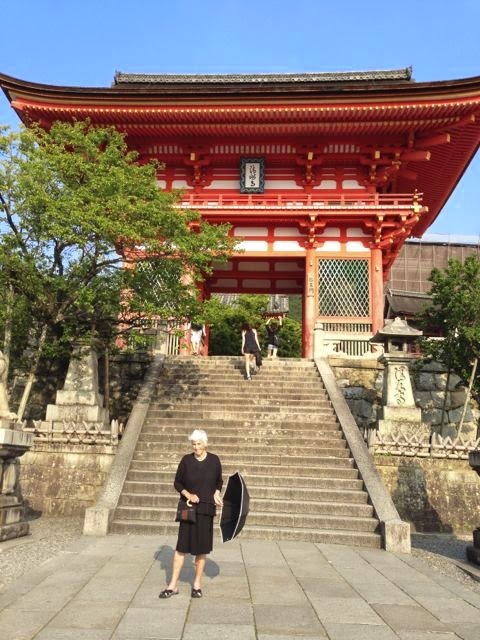 What does impress is how the Japanese restored their souls and skills and hopes and have created an amazing country that excels in business, art, fashion and friendliness so dressed in respect and humility, that we need to study how they survived and revived. They came together just as we Americans have come together for moments of tragedy. 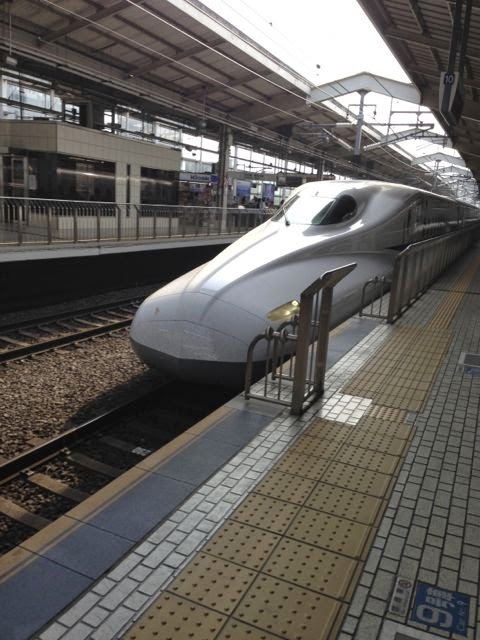 The Japanese seem to make it a continuum of their lives. We seem to fall back to our blindness to each other’s needs and prejudices and respecting each other once the tragedies pass and the negatives, fostered by the press, are more prevalent than the positives. 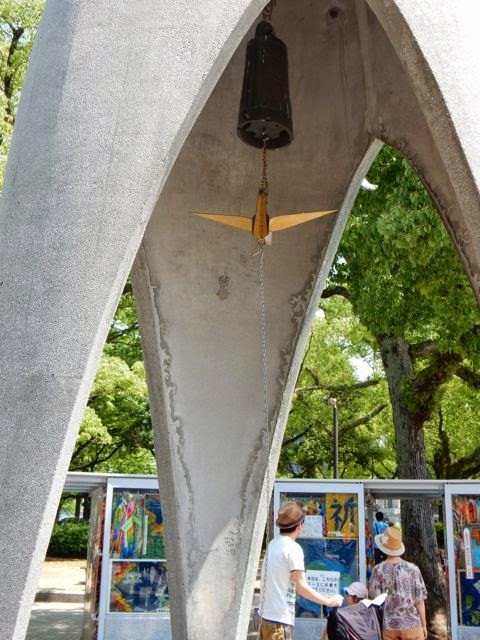 A visit to the Peace Memorial Park in Hiroshima is worth the trip. It is a sad, rejoiceful,prayerful, spiritual moment. 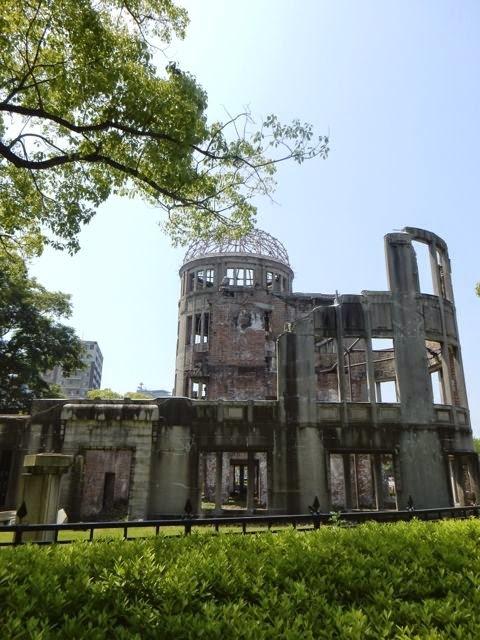 In an enormous well landscaped park is the Atomic Peace Dome - the bomb exploded directly above this huge building that was an Exhibition Hall, so the walls remained intact even as the dome shattered and other people inside were killed by the first blast. It was never rebuilt and became the symbol it is today. We stood right on the spot where the bomb hit - quite a bit off center from where it was aimed - the target had been the “T” bridge about a quarter of a kilometer away. 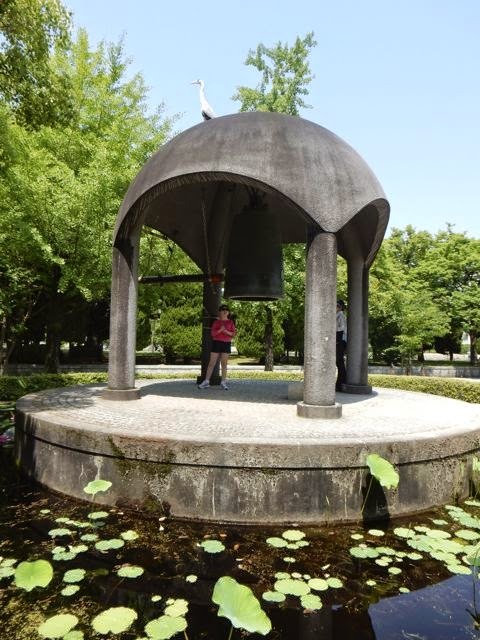 After walking around the Peace Dome, we rang one of the three peace bells, the one near the Children’s Peace Monument which is covered with an outline of the world and the sweet spot is an atomic symbol. The inscriptions on the bell in various languages means “Know yourself.” The Peace Flame is the center of the park and is best viewed from the Memorial Centotaph which holds all the names of those killed by the bomb and an inscriptions: “Please rest in peace for we shall not repeat this error.” Some Japanese rightists are insulted by this comment as an admission of guilt and condemning the Empire of old. The Flame has burned continuously since installed in 1964 with the aim of burning until all nuclear bombs on the planet are destroyed and the planet is free from the threat of nuclear annihilation. Amen to that. Caroline was shocked to learn that the United States has more nuclear weapons than any other country, with Russia a close second. The Peace Memorial Museum was difficult to push through. I worried about Caroline seeing the disasters and what man can do to man. There is no restraint on what the museum shows, but the emotional experience for me was seeing the remnants of children’s burned clothing, and in one case an embroidery piece that someone was finishing at the time of the bomb. We were given hope when we stopped by the Children’s Peace memorial where there are 10 million, maybe billions, of colorful origami cranes for piece. It is also called the “Tower of a Thousand Cranes”. Ironically, as Caroline and I rang the bell there, a live crane was standing on top of the dome. 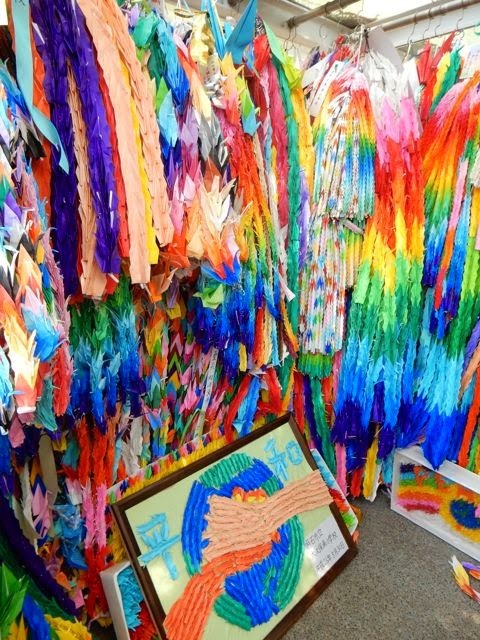 The origami paper cranes were started by a little girl who died of leukemia ten years after the bomb. 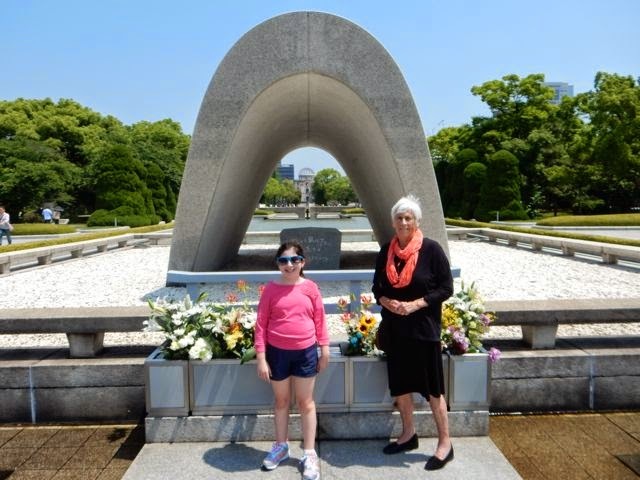 She was two years old when exposed to radiation of the bomb and after a fairly healthy childhood, fought leukemia by folding paper cranes for peace, which she felt could help her survive. She did not live, but children all over the world have taken up the cause. 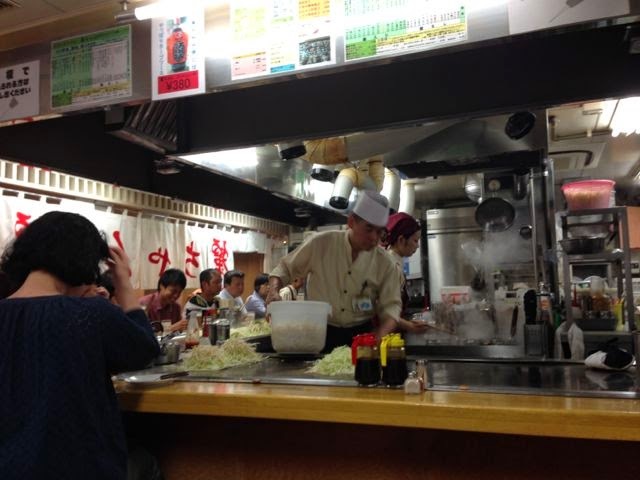 It was a tough visit to Hiroshima, but once again we were able to enjoy my favorite discovery, the okonomiyaki pancake like meal at a packed, fast moving, fast food sort of bar in the train station. This pancake, now turned into a huge meal, was created by mothers after the bomb explosion when they could not grow rice (or anything) any longer, my guide said. So the mothers created this recipe from wheat flour provided by GHQ (Government Headquarters), water and bean sprouts (which grew fast in pots). They were mixed together and fried on the grill for children to have nourishment. It grew from there but the original, the best, is found in Hiroshima and the special sauce is called Otofuku. 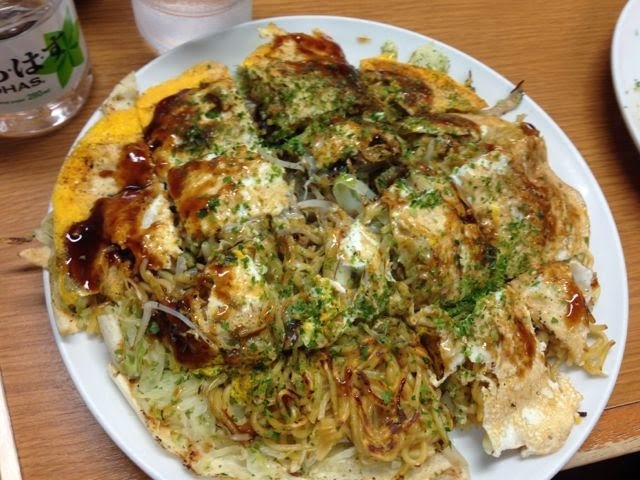 Today’s dish was made of so many things from cabbage and soba noodles to eggs and cheese and green onions, pork, shrimp, squid, and whatever was the trademark of this particular chef. It could take over pizza, folks. 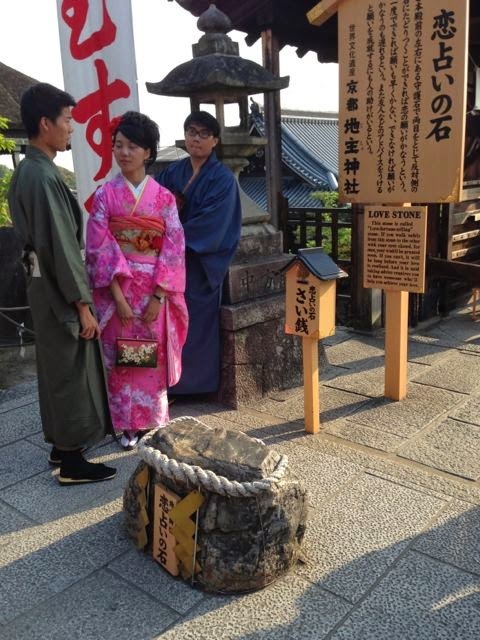 shrines were in reform and we couldn’t enter but the two stones at the top between which one seeking confirmation about a relationship or searching for a lover must walk between while blindfolded and without help. No, I didn’t try that. I was pooped and ready to get back down to James and Caroline for an adventure in pizza at a pizza bar run by an Italian on a canal. Best pizza base I’ve had.